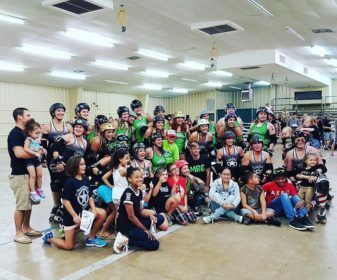 MRG traveled to Ft. Walton Beach, FL to battle against the Beach Brawl Skater Dolls this past weekend in a much anticipated rematch. Having recently attained WFTDA status, BBSD was looking sharp in their uniforms and ready to take on the ladies in green. BBSD started out of the gate with lead however their defense was no match for the jamming skills of the MRG jammers and they quickly lost lead in the first half. MRG continued to dominate in the second half with punishing defensive walls to take the win. Final Score: MRG 256-BBSD 73. This win was huge for MRG as it advanced them 25 spots in the rankings, making them one of the biggest movers of the week in WFTDA rankings. It was also a bittersweet win for MRG as this was their last bout with their star Jammer and co-captain Lucky Latke and formidable blockers, Islamay Q Scream and KDD. These ladies will be dearly missed and we wish them farewell and good luck on their future endeavors.